All of the routines of a child’s daily life can be transformed the instant the child enters the hospital. To help kids and families feel a sense of normalcy and hope and ensure that a child doesn’t fall behind in their academic schedule, the hospital collaborates with the Carlson Home/Hospital Instructional Program of the Los Angeles Unified School District. Three teachers and three teacher’s assistants serve on-site to provide education for our patients. These dedicated and compassionate professionals wear many hats in the hospital: instructor, counselor, confidante,advocate, and friend. Because these teachers meet their students for the first time in the hospital, each consults with the child’s regular teacher to better understand their capabilities. Lessons take place each school day at patients’ bedsides and in a classroom in the Rehabilitation Unit. Students generally range from kindergarteners to high school seniors. There are benefits to going to school while in the hospital. 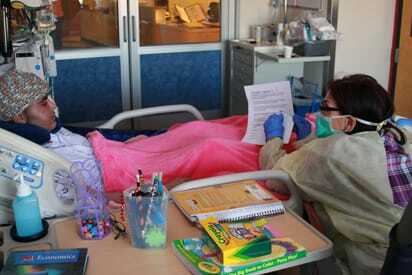 Academic learning in the hospital is often one-on-one. Teachers can often help patients solve problems that might not be solved in a classroom setting. And when a student is ready for discharge, teachers help make the transition as seamless as possible, working with clinical care coordinators, social workers, and school reintegration specialists.